The best things come in small packages and that is certainly true of this day trip. Using a minibus carrying just 18 people, this wonderful drive is similar to the Amalfi Drive route but with a more personal touch. Make sure you don’t miss the three main towns. Pretty Positano showers down the cliff-side, its near-vertical alleys crammed with cafés and boutiques. Start off with a stop in Positano followed by two hours to explore Amalfi. Then it’s time for lunch in the old-world village of Scala, one of the oldest in the region. In the afternoon, there’ll be an hour-and-a-half in Ravello where you’ll visit Villa Rufolo, the exquisite house that inspired Richard Wagner. 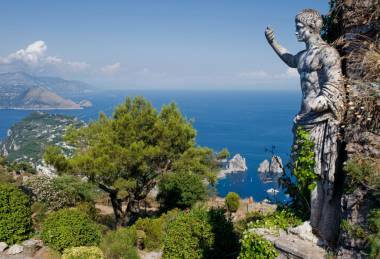 And to finish off, as you’ll be travelling by minibus, you’ll journey home along the coastal road to Sorrento for postcard-worthy views.